I spent a fair amount of time on New Years Eve and New Year’s day looking at my past resolutions posts on the blog, and thinking about what I wanted to accomplish in 2014. And as I looked at the past resolutions I had set for myself I felt a sense of excitement for all the possibilities that 2014 holds! 2014 is a New Year with endless possibilities. Do I dare say that the sky is the limit? However, this year I thought I would take a different approach to my annual resolutions! I have always liked the idea of having a few big New Year’s resolutions. You know the resolutions that are going to push you out of your comfort zone and make you a better person. Because don’t we all want to grow and become the best version of ourselves? I know I do! With that being said here are my “Big” New Year’s Resolutions! One - Run another Half Marathon (or two) and a Full Marathon. I am thinking! 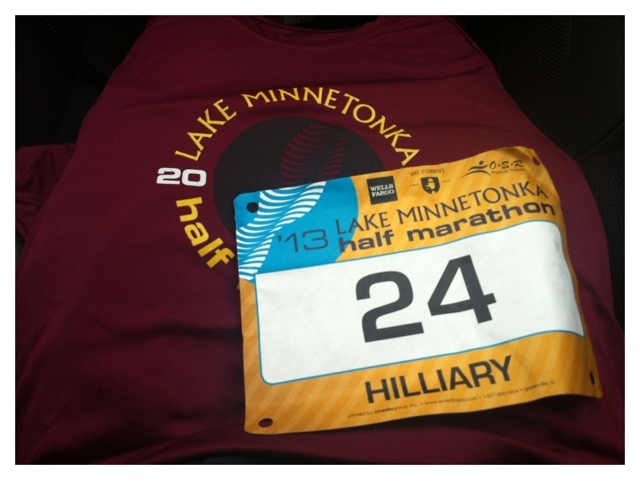 Grandmas Half Marathon, Get In Gear Half Marathon, and The TC Full Marathon. Two - Take a photography class. I really want to improve my photo taking skills and now that I have the equipment I better learn to use it, and use it well! Three - Volunteer More! I need to devote more time to giving back to my community. Volunteering makes me happy, why wouldn’t I want to do more of something that makes me happy? Four - Join a small group or a bible study at church! I tackled praying more last year, time to take my faith to the next level. Five - Spend 30 minutes a day praying/thinking/reflecting! I think I could use more of this in my life! Six - Find my unfaltering happiness! Don’t we all want to find happiness? This resolution might make me sound like I am not a happy person or that I am unhappy with my life both of which are untrue statements. I simply want to learn to be more happy with the things I have been given and not take my life for granted. This resolution might take more than a year but at least I will be thinking about it! So, now that I have gotten the “Big” ones out of the way here is how I am switching up my resolutions this year. As I mentioned I love having “big” resolutions to tackle throughout the year but I also want to have smaller resolutions that I can implement in my life as a daily “Gut Check” I guess you could say. I got this idea after attending a networking event at work on the topic of happiness stemming from the book The Happiness Project By­­ Gretchen Rubin. During this women’s networking event one of the guest speakers talked about how she disliked new year’s resolutions and how instead she had daily resolutions or guiding principles in her life. At the end of each day this women would check in and see if she met all of her daily resolutions/guiding principles that day. See, a mini gut check. This women’s guiding principles for her life were based on her beliefs, what was important to her and how she wanted to be perceived as a person, and as I left this networking event I began to think of what would be my guiding life principles, my daily resolutions, my daily gut check. So, here they are I am going to call them my 2014 Daily Gut Check! Those 6 points tie back into my beliefs and who I am as a person. In 2014 I strive to live by those guiding principles and am ready to implement my 2014 Daily Gut Check. The daily gut check ties in nicely to one of the 2014 “Big” Ones, spending 30 minutes a day thinking/praying/reflecting! Well there you have it folks, my 2014 resolutions. From the big to the small they are all important. Here is to pushing the limits, and making 2014 the best it can be! Thanks for the sweet comment Bri! :) I am so glad to have you around too!! !